1. The stand out headline which the BBC has run with is the sheer number of households moving into arrears. JRF’s own analysis had already indicated that arrears were going to be high but now the government’s own research confirms fears of rising arrears with a staggering 59% of people affected by the bedroom tax in arrears. This is really worrying: we hear from families everyday facing homelessness because their debts, including rent arrears, have spiralled out of control. 2. Many of the families we speak to prioritise paying their rent even when they are struggling. They know just how important keeping a roof over their head is. What’s particularly interesting is how many households affected by the bedroom tax in and arrears are trying desperately to make up their rent shortfall. The research found 39% of those affected had paid some of their rent shortfall. This suggests that these households know the importance of paying rent and have managed, somehow, to cover some of the gap – but simply do not have sufficient income to make up the shortfall. 3. So what are the options for people who are unable to pay their rent? 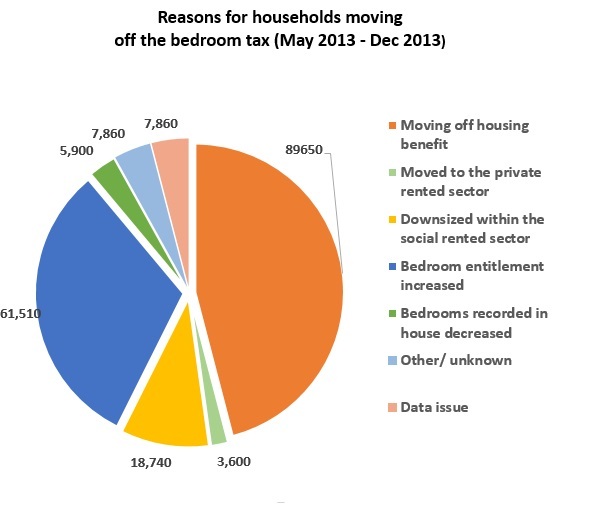 When you look closely at today’s analysis it shows that few households affected by the bedroom tax have moved. Since its introduction 22,340 households are no longer affected by the bedroom tax as a result of moving, either within the social sector, or to the private rented sector. This is equivalent to less than 5% of those affected (at December 2013). This indicates that downsizing may not be a realistic option for many. 4. What this chart shows is that over a third of households no longer affected by the bedroom tax, have been through a reassessment process which has found that they should not be caught by the bedroom tax. Some of these households will have been granted an additional room for their disabled child, something we campaigned vigorously on behind the scenes. In other cases, the size of their house may have been wrongly assessed in the first place. 5. What this all adds up to is that the number of people actually affected by the bedroom tax is a lot lower than anticipated. The government first estimated that 660,000 households would be caught by the bedroom tax. What we now know is that the real figure is 491,741 (as at December 2013). The government have been forced to grant numerous concessions on who should be affected in the face of overwhelming evidence of why this blunt policy is unfair. 6. It’s now clear that the government won’t save what it intended to save. It means it is unlikely to save anywhere close to its initial estimate of £445 million. JRF suggested that the real figure would be closer to £330 million based on 498,000 households being affected at the end of November. Today’s figures show even fewer people are affected meaning savings will be even less. We are quite clear that the bedroom tax should be abolished. These latest statistics only serve to strengthen our resolve. Penalising people for having a spare bedroom is unfair when there is no smaller accommodation for them to move into. The measure is saving less than anticipated and the number of amendments required to make the cut fair and protect everyone who has a legitimate need for extra space are so numerous that it makes more sense to abolish the policy all together – or more families will risk spiralling into debt and arrears and face the loss of their home. This post originally appeared on the Shelter policy blog and is cross-posted here with permission. Work areas: Housing, Welfare State, Inequality. Tags: bedroom tax, council housing, housing, housing market, inequality, politics, poverty, social housing, welfare.